What's New in the Virtual Contact Center 9.6 Release? In this release of Virtual Contact Center 9.6, we have introduced the following new enhancements which will improve the productivity of agents, supervisors, and administrators. Whether you are an agent, a supervisor, or an administrator of Virtual Contact Center, you will certainly love the new refreshed user interface of all our applications. Look out for the notifications when you launch your application. Please note that we have kept all our functionality workflows intact so there is no learning curve for you. Agents using the Local CRM can now craft their cases, follow-ups, and FAQs using the updated rich text editor. Drag and drop your images or paste them from your clipboard quickly improving your productivity. Assist your callers with more elaborate FAQs not worrying about the limited word count. The character limit for your FAQ is now increased from 4k to 40k. Simply log in to your Supervisor Console. From the Menu, select Help > FAQ. Add a new FAQ that runs to approximately 3-4 pages of text content. Save the FAQ. You will notice the FAQ is saved even if the character count exceeds 4K. You can now save email addresses exceeding 55 characters. The maximum limit now stands at 254 characters. This change allows many areas such as saving longer email IDs of agents, customers in Local CRM, setting up email notification for voicemails, and more. For the complete list of areas benefited with this enhancement, see below. When you embed a high-resolution image in your case, a follow-up, or an FAQ, they are compressed automatically for faster processing and for saving bandwidth. Simply drag and drop the desired images into your content. Note: The maximum size allowed for image attachments is 20 MB. You can drag and drop images up to a maximum size of 10 MB. During the number porting process, 8x8 offers a temporary phone number to enable business continuity. You can assign this temporary number to a Virtual Contact Center channel and configure call routing by associating an IVR script. Once the porting is complete, the temporary number is automatically replaced with the ported number in the Virtual Contact Center channel list. Other associations of the temporary number such as agent caller-ID, outbound phone code lists, caller-ID in outbound campaigns, CLID instances in IVR script are also replaced by the ported number with the following exception. Calling-ID (CLID) for active campaigns: The temporary numbers associated with active campaigns are not automatically swapped with the ported numbers. The temporary number shows up as the CLID until the campaigns are completed. For scheduled campaigns that haven't started, the CLID gets updated automatically. Note: This applies only to Virtual Contact Center tenants created using SMP (Virtual Contact Center Editions 1.1 and above). For VO-VCC deployments done via SMP, admins can use the Virtual Office-Configuration Manager to port a non-8x8 phone number to 8x8. To learn about porting your numbers to 8x8, click here. To learn about assigning phone numbers to Virtual Contact Center channels, click here. In this release, we have addressed the following bugs reported by customers. VCC 26680 In Local CRM, while running a case report searching by description fails to retrieve the right information. VCC-26375 Refreshing or relaunching the Agent Console disables the transfer button. 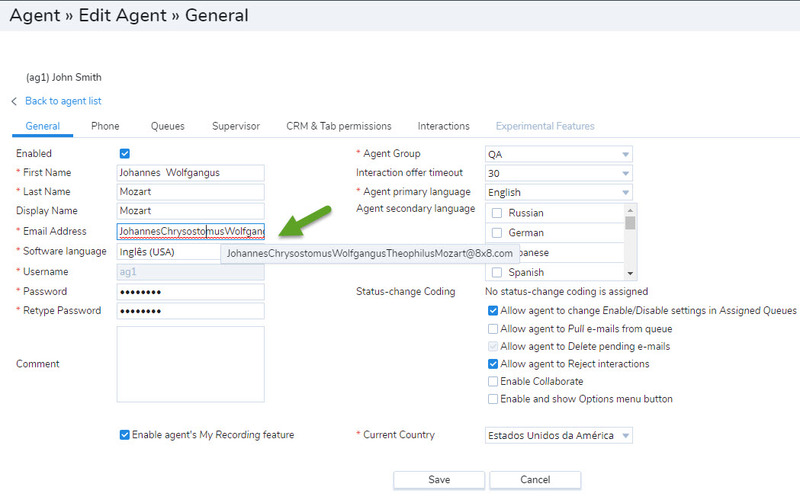 In Virtual Contact Center tenants using Single Sign-On, the password reset period is not enforced correctly. When supervisors are monitoring agents during campaign calls, do not see any monitoring information. VCC-24895 In Agent Monitoring, sorting the monitoring data by agent name occurs page by page and not for the entire list. VCC-24342 Chat stopped working once the schedule was deleted. VCC-24272 Caller is not transferred to the IVR Exit Point on immediate drop of E-IVR leg. Calls are being dropped intermittently after agent accepts the call with destination out of order as the cause in the hangup event. VCC-24067 Status codes are getting erroneously populated from cache. VCC-23907 In Local CRM, intermittently the addresses in the "From" and "to" boxes disappear and the signatures will go blank until the page is refreshed. VCC-23879 Open/Close Business hours advance by an hour before schedule. VCC-22925 In an agent-to-agent call, emails fail to trigger when voicemails are left. VCC-1655 The note added along with a transaction code before ending a call fails to show up in the Detailed Transaction report If you are using Chrome V60.xxxxx.